Did you know you can use TextIt to send SMS anywhere in the world? 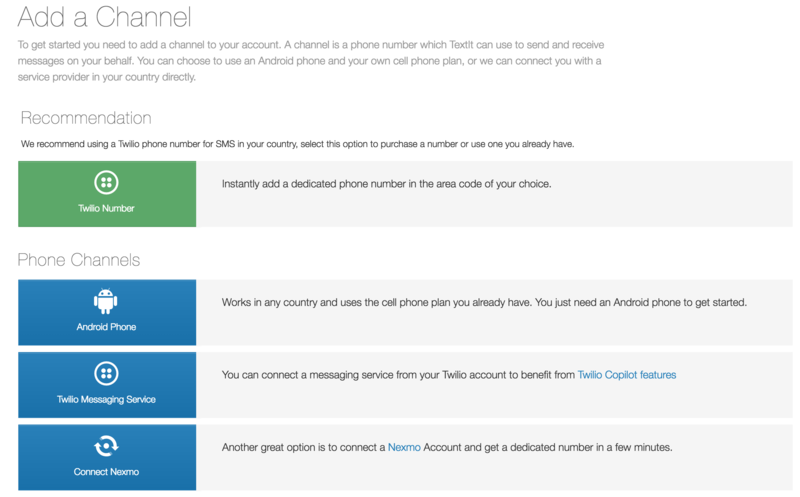 TextIt's channels module allows you to connect virtual numbers and short codes world wide to your account through services like Twilio, Nexmo, Plivo or the carriers themselves. A perfect example is a recent SMS campaign conducted by the United Methodist Church, which used a combination of channels to send over 80,000 text messages to over 3,300 contacts across 12 countries in 4 languages in just 3 weeks. In most cases, they can be purchased for $1-2 per month from Twilio, Nexmo, or Plivo, and connected to your TextIt account in seconds. All you need is an account with an aggregator; connecting your numbers is as simple as providing us your account Token and Secret. After that, your numbers will be displayed for use. VNs can be either local or international, with local being the most common. Local VNs are sourced from a specific country and most performant there, while international numbers are capable of sending messages globally but may be less performant depending on the country you wish to send messages to. If your country isn’t on this list, but you know of a local aggregator that provides VNs and/or short codes, let us know. We’d be happy to add them for you. If you plan to send 1,000 or less messages per hour, the TextIt Android application is a convenient alternative to VNs and short codes. Simply download the app on your Android phone, connect it to your TextIt account, and start sending. Note that you can add as many relayers to your account as needed. You can learn more about Android relayers here, and use this guide to start sending. Short codes are your best option if you expect to send a high volume of messages and aren’t able to locate a local aggregator in your region. Short codes can be acquired by carriers themselves, and you can use sites like OpenSignal to determine which has the most coverage. Once you’ve acquired your short code, we can connect it for you. If SMS isn’t ideal for your use case, you can use TextIt to reach anyone on Facebook Messenger, Telegram and Twitter. Note that each account operates within a single time zone, and that accounts with multiple international channels behave the same as others. International channels are first matched with contacts by country, then by number prefix. 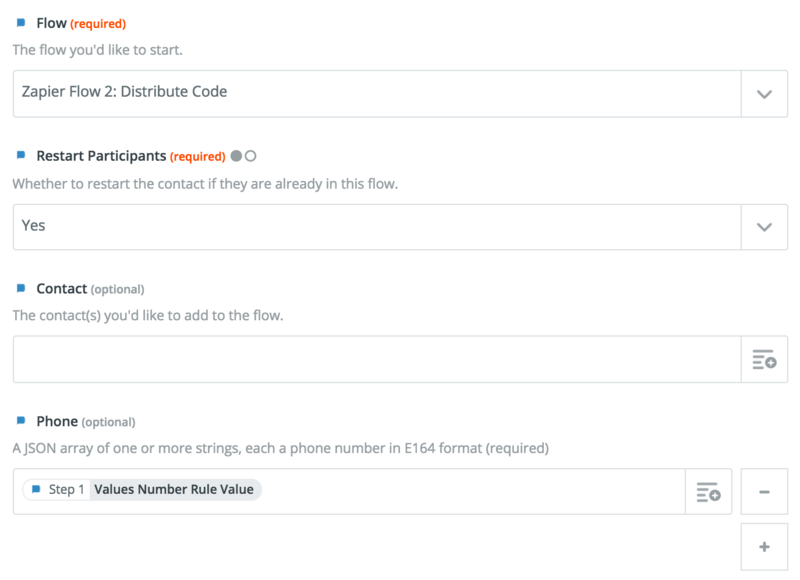 If sending via Twilio numbers, you can create a messaging service that adds additional logic to channel matching through your Twilio portal. Follow us on Twitter to interact with a chat bot built with TextIt, or create a free account to build your own. You'll be sending messages in minutes! Get in touch anytime with any questions, comments, or suggestions. 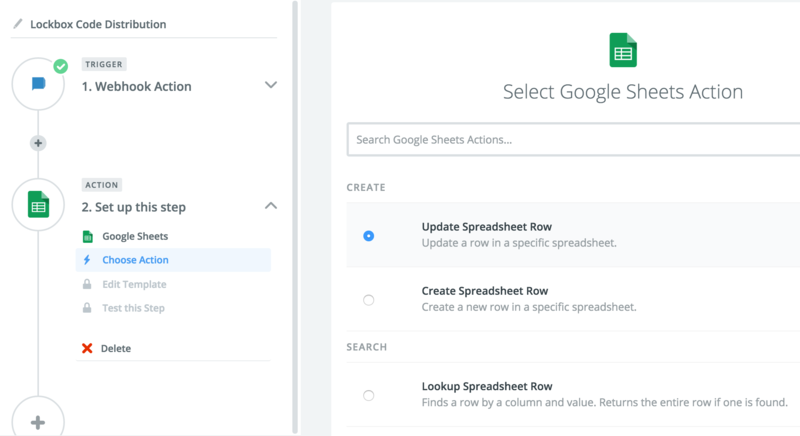 Quickly and easily configure your flows to communicate with a Google Sheets 'database' without writing a single line of code. Google Sheets are handy for storing data outside of TextIt that can then be distributed to any of your contacts. Distributing and verifying coupons and vouchers. Adding contacts who complete a web form to a flow. 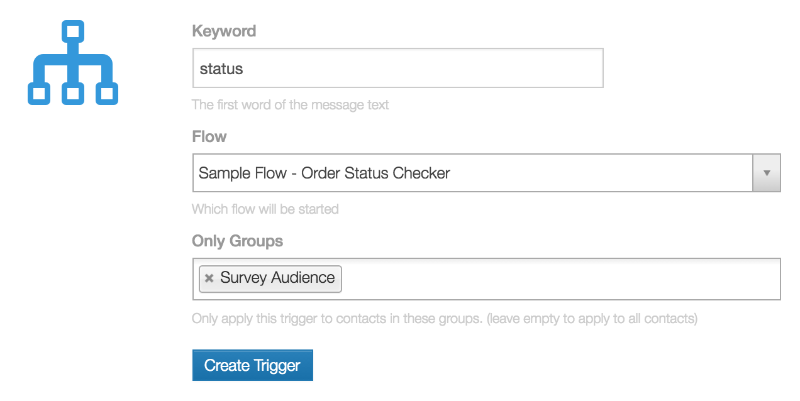 Adding Salesforce contacts to flows. Use HookPress to trigger flows from actions taken on your Wordpress site. The high-level, low-requirement functionality Zapier provides falls in line with the purpose of TextIt: enable anyone, regardless of technical know-how, to build highly performant messaging applications and chatbots. A first-class TextIt Zapier app is on its way. In the mean time, you can follow this link while signed-in to your Zapier account to gain unlimited access. Worried about managing the costs of both services? Don’t sweat it. The great thing about private Zapier apps is that you can use them to build multi-step Zaps on a free plan (a restriction if using only global apps). This article highlights the integration we’ve observed to be the most useful: TextIt <> Google Sheets. 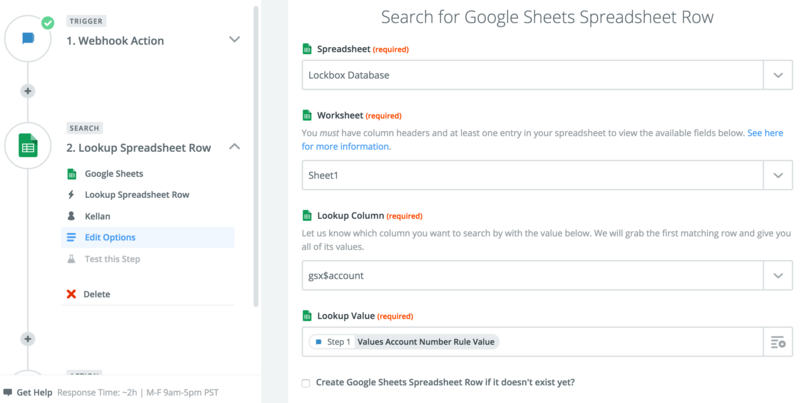 Why Google Sheets? It enables you to create one or more external databases and connect them to TextIt in minutes. First, a primer on data storage within TextIt. There are two ways to store and distribute data via your TextIt account. The first is via flows. 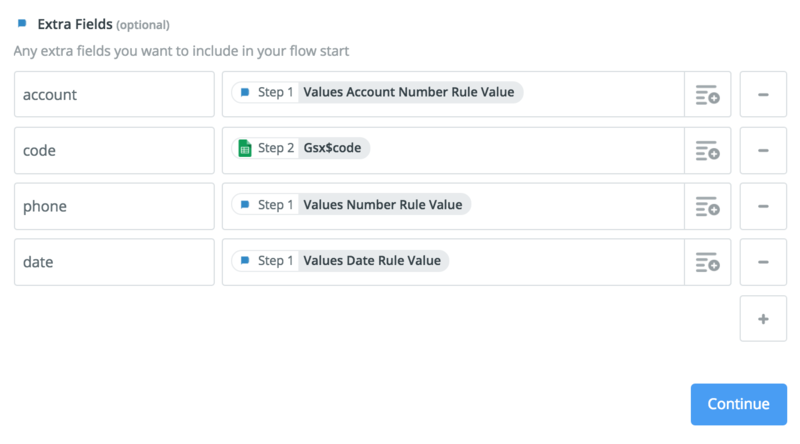 Inside a flow, you can use RuleSets to collect data from your contacts which is then stored as a flow field with a corresponding flow variable, initiated by the '@flow.' variable prefix. 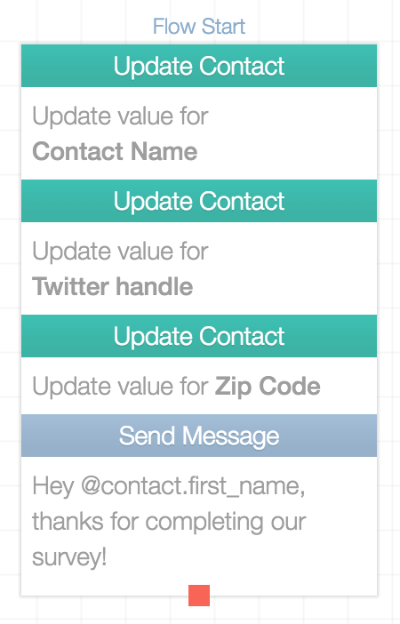 You can then distribute data via Send Message actions. 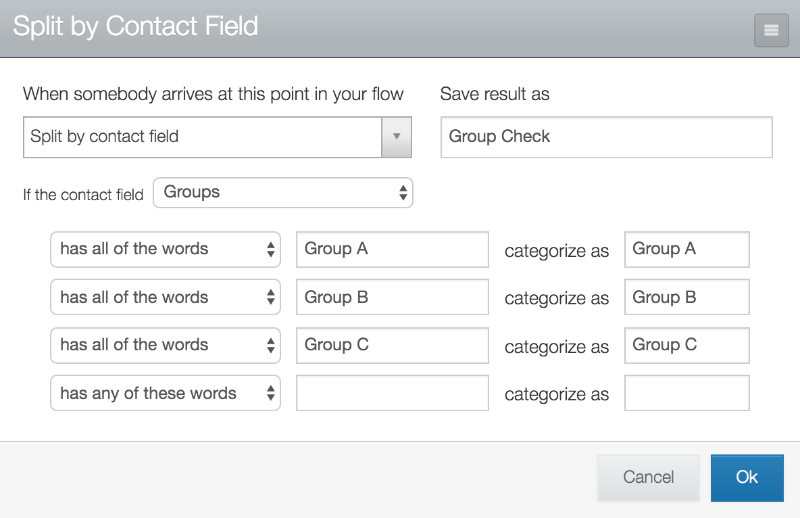 The second is via Contact Fields, which allow you to store data as attributes on each contact, though no contact can reference another (unless they're started in a flow when another contact reaches a Start Someone Else in a Flow action in a separate flow, in which case they can reference the previous run's fields (using the '@extra.flow.' variable prefix) or the contact (using the '@extra.contact.' variable prefix). Storing, distributing and verifying coupons and vouchers. 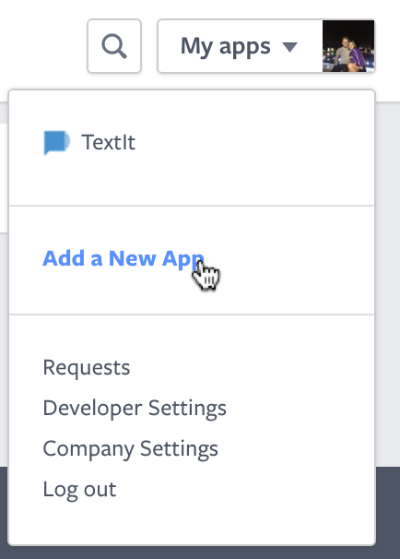 Storing flow fields outside of TextIt instead of creating new contact fields. Managing signups for an event, service or job. What better way to demonstrate this configuration than an example? A. Barr Simpson, a distributor and manufacturer of fountain soda products, uses TextIt's Zapier app to manage its padlock spreadsheet. A. Barr Simpson delivers certain products with a lockbox. In order for customers to receive the product's code, they must interact A. Barr Simpson's TextIt application. The flow (1) asks for the active contact's account number, (2) uses 'Split by Expression' RuleSets to convert the contact's name, phone number (in E.164 format) and the date and time at which the contact requested the code to flow fields and (3) posts this information to the URL that our 'Webhook Action' trigger provides (click here for a comprehensive guide to our 'Webhook Action' trigger). This spreadsheet will eventually contain the information of the customer who last looked-up the code and the driver who last updated the padlock's code. I entered the account number '1010101', so the row containing this number will be updated. Zapier will then update the spreadsheet with the sample data I've selected. From here on out, these will be the data updated to my spreadsheet when a contact completes the associated flow. Notice the '@extra' variables. These will be used to reference values in my spreadsheet. When the contact starts the flow, they'll be replaced with the values I choose. I've also added Send a Message to Someone Else and Send Email actions to notify me when a customer has accessed their padlock code. The contact's phone number will work just fine for this example. Note that the 'Restart Participants' field must always have the value 'Yes'. 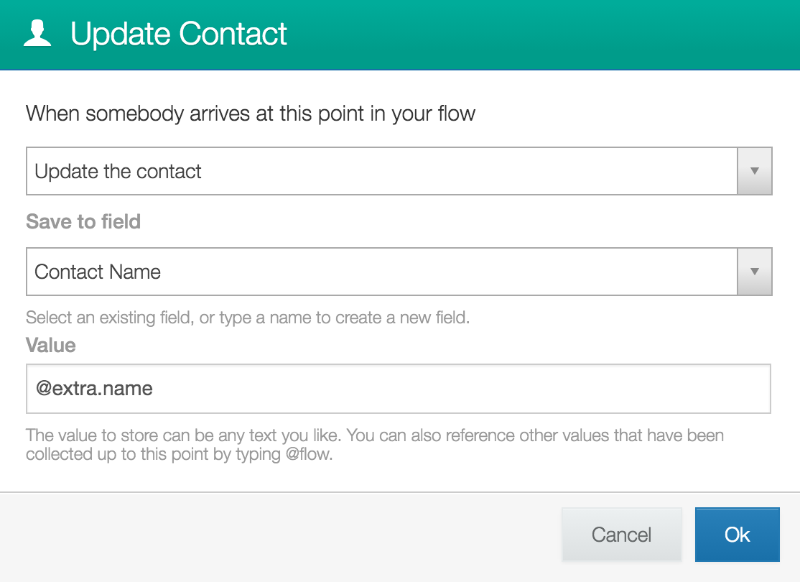 This ensures contacts who've already completed this flow will be able to enter it again. Note that field names entered in this step are case-sensitive; always use lowercase letters. That's it! 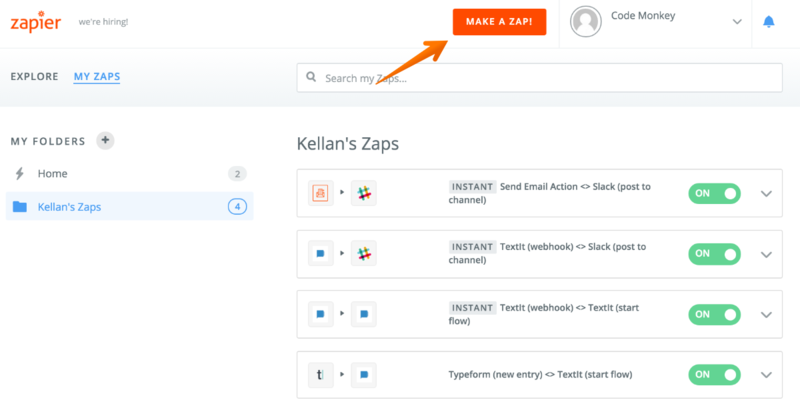 Turn on your Zap, organize it with a folder, and sit back as TextIt and Zapier automate the rest! 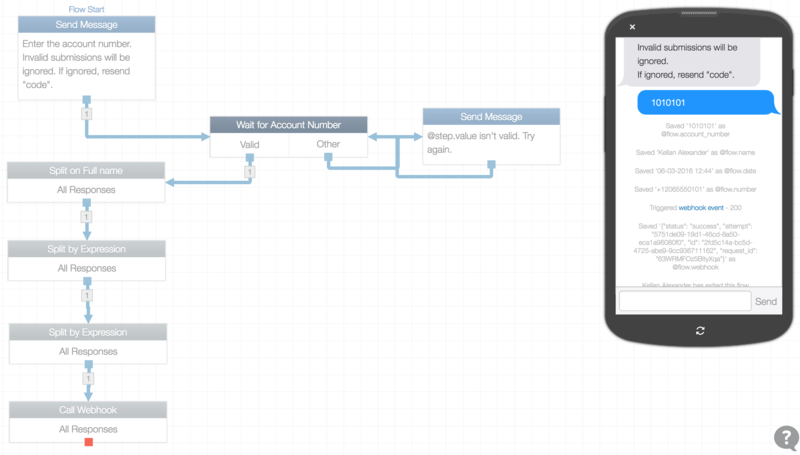 TextIt is a visual programming language used to build messaging applications and chat bots. A core concept of this language is the flow: a series of of actions and rules used to build branch logic (also called "conditional branching" or "skip logic"). An application or chat bot may comprise a single flow, or many connected by Start Another Flow or Start Someone Else in a Flow actions. 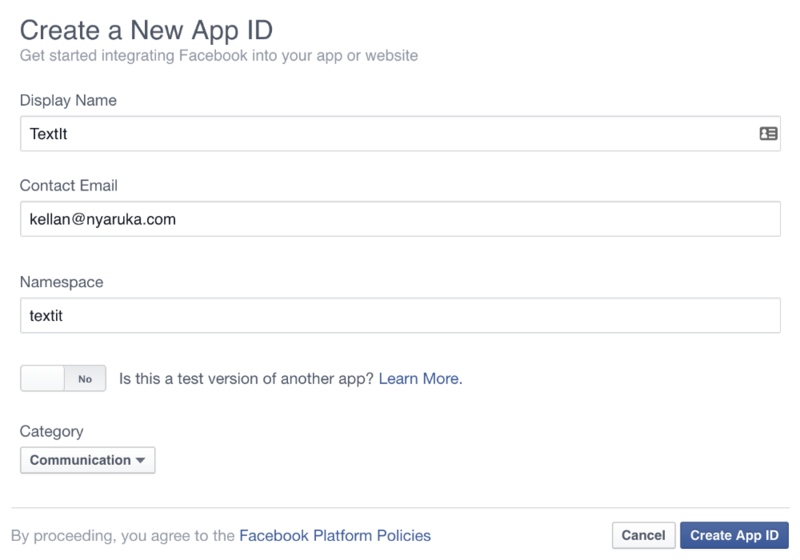 Being that any single account may contain more than one application or bot, we'd like to explain how you can restrict access to each of your flows (and, by extension, your applications or bots). First, it's helpful to understand how the modules that comprise your account interact. Each account contains channels, contacts, flows, campaigns and triggers. In this article, we focus on channels, contacts, flows and triggers. You have multiple channels of the same type connected to your account. The contact's address type corresponds with the channel type (e.g. phone number) of one or more of your channels. The contact messages the channel. Note that if you have multiple Twilio numbers connected to your account, you can create a Messaging Service via the Twilio console to add additional logic to modify your channels' message routing behavior. See this guide to learn more. Once you've mapped your desired channel relationships, you can restrict access to your flows by assigning groups to your keyword triggers. If a contact doesn't belong to one of the keyword's groups, they won't be able to interact with the flow. Consecutive messages sent to the same contact are now delayed by one second to ensure they're delivered in order. Stack away! Your contacts' profiles now display failed, unanswered, busy, and canceled calls. Keyword, missed call, and uncaught message triggers give you the option of selecting the group(s) to which they apply. This allows you to limit flow access. The Message Tab allows you to see which messages are sent by your flows, and which aren't. The 'Inbox' tab displays incoming messages not handled by your flows, while the 'Flows' tab only displays incoming messages handled by your flows. Those looking to display flow results in real time can do so via a TextIt/Google Sheets Zapier integration. Follow this tutorial to build your own dashboard to display the results. Full-featured media support is on its way! This quarter, we made changes to enable you to collect images, videos, files and even GPS coordinates. First, we populated incoming Twilio MMS with URLs. Now, we're displaying media collected via Twilio and Telegram channels on each contact's profile (link). Those who wish to programmatically export data from TextIt can do so via the flow runs endpoint, which will give you the same data as an Excel export. You can grab contact fields separately using the contacts endpoint. The contact bulk action endpoint allows you to add, remove, block, unblock, expire, archive and delete up to 100 contacts per call. You can account for inadvertent message send errors (like Twilio's invalid phone number or invalid phone number format errors) by starting contacts in a flow that asks them to respond (to confirm message receipt), then place only those who responded in a group that receives followup messages. You can view a channel's error log by navigating to your account page and clicking on the channel. Note that Twilio MMS addresses different carrier restrictions by automatically resizing images you send to meet the exact specifications of the receiving carrier. Media is currently loaded in each contact's profile. Elsewhere, it's represented by URLs. This includes flow results exports and contact fields. 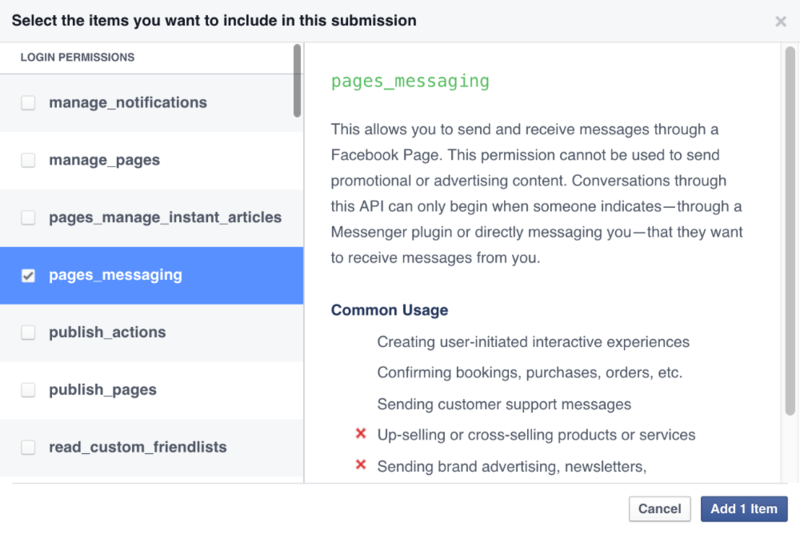 Last week, Facebook launched the Messenger Platform (beta), a platform that allows developers to build interactive chat bots to communicate with over 900 million monthly Facebook Messenger users on behalf of any Facebook Page (the promotional kind). This week, we released a Facebook Messenger channel that will allow you to leverage TextIt’s visual, drag-and-drop interface to build and deploy your own Messenger bot. Each bot will map to a TextIt account. Build just one bot, and your experience is available on all platforms where Messenger exists, including iOS, Android, and the web. Use this guide to submit a Messenger app for review and connect it to your TextIt account (link). A single account may now contain channels in different countries. How this effects channel-contact behavior: If not yet contacted, TextIt will assign channels to contacts based on their country. Once a contact has responded to a channel, they'll continue to receive messages from that channel unless they send a message to a different channel, in which case they'll become tied to the new channel. To link contact fields to flow results, simply add contact fields to your flow results export. If you'd like to display results via your own dashboard, checkout TextIt's API, which will allows you to externally display contact fields, flow results and more. Those interested in visualizing a certain type of response (like the categories through which each contact passes in a flow) should consider updating them to contact fields once they've been evaluated by a RuleSet, then executing a contact export. This allows you to (a) ensure the correct values are assigned to your contacts' fields, and (b) skip the process of pulling specific columns out of a flow results export. Note that response categories can be called using the '.category' extension, e.g. @flow.response_1.category. More on TextIt variables here. If your application solicits and updates contact information to specific contact fields (like a registration form or the like), you may want to search for contacts missing a value in specific fields. You can do so via the search bar in the contacts tab: simply enter the query contact_field="", where 'contact_field' is the name of the field you're searching. For example, if we want to look for contacts who haven't yet provided their gender, we can use the query gender="". We're testing a new Zapier integration that allows you connect more than 500 apps to TextIt. It's currently private, but we're giving out an invite link to those who'd like to give it a try (link). 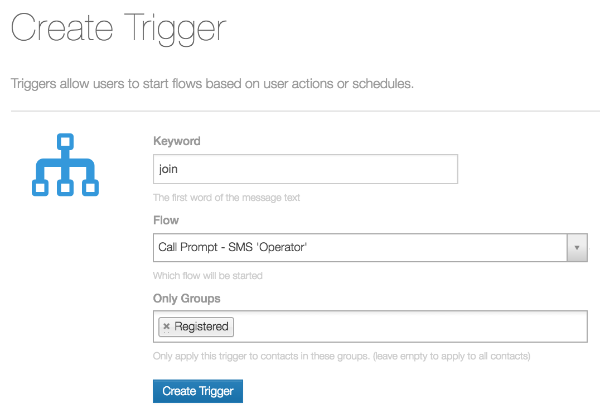 Use this guide to learn about the 'Start Contact in a Flow' action we added to Zapier. Specifically, learn how to use information collected by a Typeform to start a flow (link). 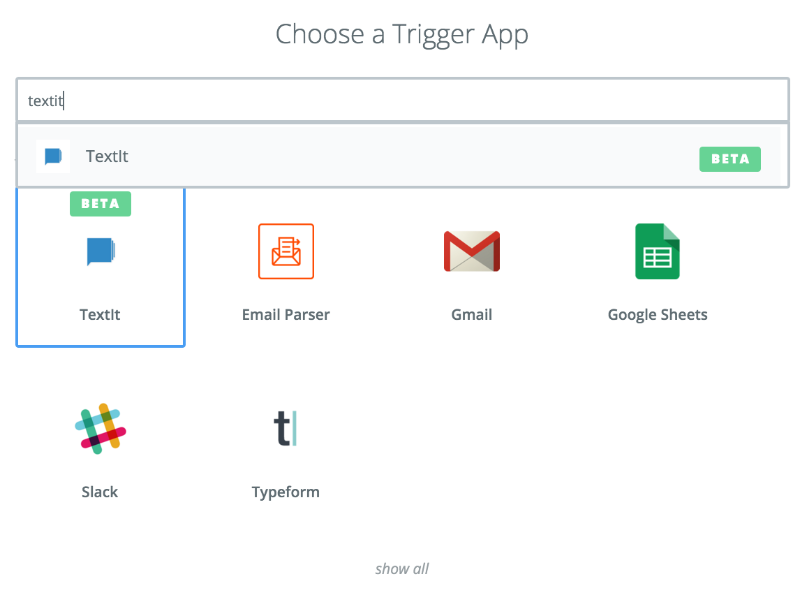 Use this guide to learn about the Webhook trigger we added to Zapier. Specifically, learn how to post information collected by a flow to a Slack channel (link). 'Start Another Flow' actions in IVR (voice) flows now route to the new flow without forcing a hangup. We shipped a new version of the Nyaruka TextIt Android app, version 1.8.1, which makes TextIt more aggressive when retrying failed messages. This change is intended to offset lack of network reliability in developing cellular markets. Runs: the runs tab displays all the times your contacts have gone through a flow, as contacts can pass through a flow more than once. 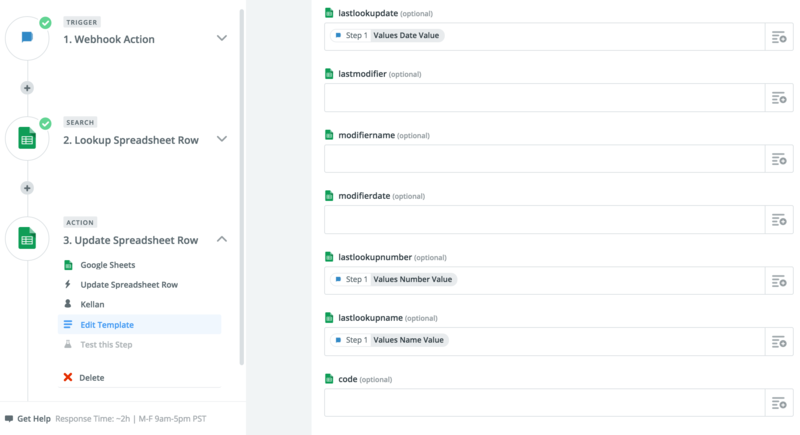 Contacts: the contacts tab shows the values in the last run, as well as the last value for each flow step, which may have been visited more than once if the contact was was ever redirected to it. Messages: the messages tab displays every message sent from the flow to your contacts and vice versa. It provides the message direction (IN/OUT), text, date and contact information. Follow us on Twitter to interact with a chat application built with TextIt, or create a free account to build your own. You'll be sending messages in minutes! Get in touch anytime with any questions, comments, or suggestions. Use this guide to learn how to start a flow via one the 500+ apps available on Zapier. Specifically, this guide will show you how to use information collected by a Typeform to start a flow. Typeform is a service that helps you create beautiful, intuitive web forms. If you ever need to run a survey, questionnaire, form, contest, etc...Typeform will help you do so seamlessly across all devices, every time, using its unique platform. Don't have an invite link? Click here. The fields created by the Typeform entry are sent to TextIt. TextIt starts anyone who completes the Typeform in a flow. Zapier watches your apps for new data, and kicks off triggers and actions based on the rules you set. Each trigger and action pairing is called a 'zap', and each zap begins with a trigger. In this case, the trigger will be a new Typeform entry. Once you've created your Zapier and Typeform accounts, you'll need to create the Typeform itself. Ask anything you want, but you'll need to acquire the respondent's phone number (country code included, e.g. 17078888744) to start your flow. Here's an example. The flow you want to start. The Typeform question that will populate the 'phone' field. Whether or not you'd like to restart the flow for contacts who've already entered it. Lastly, you can add any extra fields you'd like to insert into the flow and the corresponding Typeform questions. You can reference these fields in a flow using @extra variables, which refer to values pulled from an external application or another flow. The fields you create should be lowercase. Once the contact's Full Name field is updated, you can reference their first name using the variable @contact.first_name. 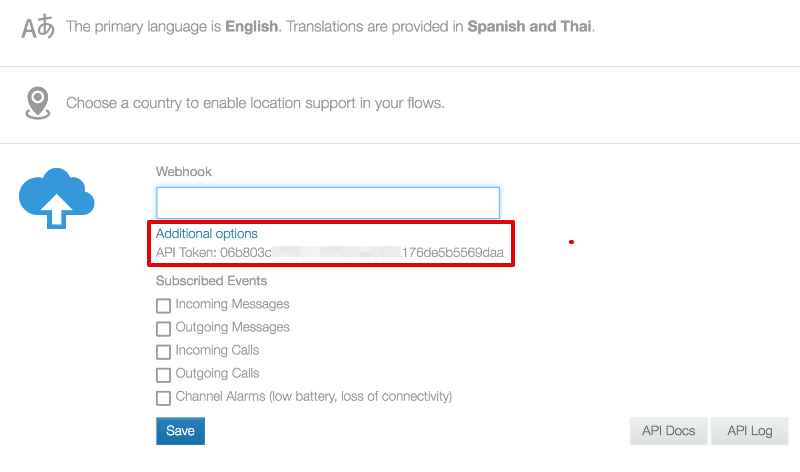 To learn how to send information collected by your flows to other apps via Zapier, click here. TextIt is changing the way organizations communicate with customers, beneficiaries, constituents and stakeholders. Whether you're interested in adding an SMS messaging channel to your communication pipeline like WebHelp Groupe, or building chat bot like HigherMe, you're guaranteed to increase engagement and efficacy. An E-commerce company can use TextIt to improve funnel abandonment by texting discount codes to customers who put something in their cart but don't purchase. An on-demand company can push text notifications when their delivery is on the way or manage a fleet of workers who won't be on computers but will always have their phones. Any company can measure Net Promotor Score or customer satisfaction by sending messages that are more likely to be read and responded to than any other form of communication.